We have sold lots of Amtron PCD-TP-110CS to dental community for dentists to read digital x-ray image data and manage DEXIS digital diagnostic imaging program on desktop computers in dental offices. The DEXIS primary digital X-ray device uses a type II 16-bit PCMCIA PC Card (sensor card) as the interface to a host computer system. The host computer, such as desktop or notebook PC & Mac, must have a PCMCIA PC Card slot to accept the DEXIS interface card (sensor card). 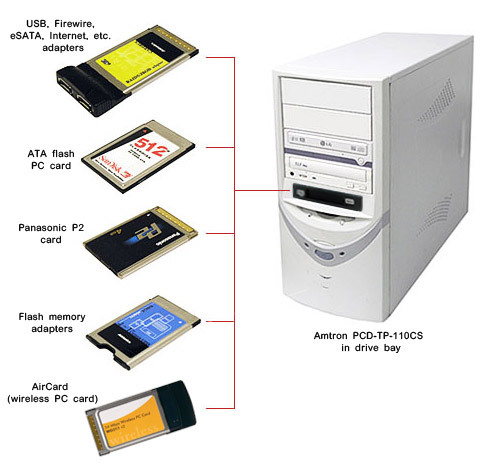 Installing this Amtron PCD-TP-110CS PCI-to-PCMCIA card drives is the most ideal method to add a PCMCIA CardBus PC Card slot to a desktop computer (standard, mini-tower, low-profile, slimline, small form factor). The front drive bay mounting or externally stand-alone design make inserting or removing DEXIS PC card much more convenient. Windows XP & Vista will detect this hardware and install the Windows built-in driver automatically. Macintosh Users: please check the PCI expansion slot requirement. Support all kinds of 16-bit PCMCIA PC Cards and 32-bit PCMCIA CardBus cards. Operate PCMCIA wireless 3G / 3.5G AirCard for wireless broadband connection internet access. 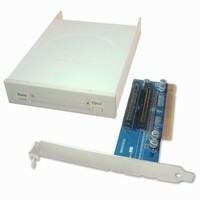 Operate DEXIS Digital X-Ray System PC Card. 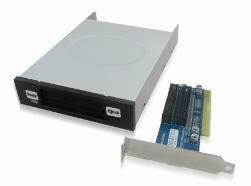 The PC Card Reader unit can be mounted in a 3.5" drive bay or a 5.25" drive bay. To mount the Card Reader in the wider 5.25" drive bay, a 5.25" drive bay mounting kit (which is included in the package) is required. The Card Reader also can be set as a stand-alone external unit. For larger size computer, such as mini-tower, please order the 25-inch cables set. Please read the special note for some slimline / small form factor computers, such as "Dell OptiPlex 755 small form factor". Card Reader front panel (faceplate) color option: Black or Beige. Please check System Requirements before you purchase this product! NOTE: In some slimline / small form factor computers, such as "Dell OptiPlex 755 small form factor", the drive bay space is partially occupied by the computer power supply assembly, the Card Reader unit can not be inserted deep enough to be flush with the computer case surface. In this situation, the Card Reader unit could be mounted externally. However, external mounting is not highly recommended due to cosmetic reason. Please purchase the 25-inch cables set for external installation. Installing this low-profile PCI-to-PCMCIA card drives is an ideal method to add a PCMCIA CardBus PC Card slot to a desktop computer of any form factor (standard, mini-tower, low-profile, slimline, small form factor, etc). This high performance PCI interface front-access single-slot PCMCIA PC card reader-writer is compatible with any desktop computer with an available PCI expansion slot. The front 3.5" or 5.25" drive bay mounting or externally stand-alone design make inserting or removing PCMCIA cards much more convenient. This PCI-to-PCMCIA CardBus PC Card Reader supports all kinds of PCMCIA Type I, Type II, & Type III 16-bit PC cards (such as ATA flash memory card, hard drives, linear flash card, SRAM card, wired / wireless IEEE802.11b or Bluetooth ethernet network/LAN and modem card, DEXIS interface card, I/O card, etc.) and 32-bit CardBus PC cards (such as IEEE1394 / USB2.0 / eSATA adapters, 3G/ 3.5G wireless modem PC Card, Panasonic DVCPRO P2 card, etc.). This PCMCIA card drives also reads & writes other types of data storage cards such as CompactFlash (CF) card, MicroDrive, Memory Stick (MS & MS Pro), MultiMediaCard (MMC), Secure Digital (SD) card, xD picture card, SSFDC SmartMedia (SM) card .. etc with the proper PCMCIA adapter. For customers who live in an area without wired high speed broadband connection, this PCD-TP-110CS PCMCIA CardBus card adapter allows you to use a laptop wireless PC card on your desktop computer for wireless mobile broadband connection internet access. Amtron PCD-TP-110CS is recommended for wired and wireless modem PC cards (3G / 3.5G AirCard) such as Verizon / Sierra AirCard, Novatel Merlin, Cingular EDGE, Kyocera Passport, Sprint, T-Mobile, AT&T, Netgear, AirPrime, ACS, Fiberlink, SK-Earthlink, Qualcomm, and other wireless PC card modems using CDMA, WCDMA, EDGE, GPRS, GSM, UMTS, HSDPA, EV-DO (EVDO) technology. Support Windows XP, Vista, & 7. Windows XP, Vista, & 7 will detect this card reader and install the Windows built-in driver automatically. Work with Windows 98SE/ME/2000 with optional IRQ steering driver. One type III front access PCMCIA socket support both 32-bit CardBus PC Cards and 16-bit PC Cards. Full-height (4.75" / 121mm) end bracket (backplate) for standard desktop PC including mini-tower. 2/3-height (3.15" / 80 mm) end bracket (backplate) for low-profile (slimline / small form factor) desktop PC. Complies with PCMCIA PC Card 95/97 CardBus Standard Specification. Complies with PCI Local Bus Specification Revision 2.2. No need for any ISA IRQ Board. Support IRQ steering: native driver built in Windows XP, Vista, & 7. Supports Type I, Type II, Type III 16-bit PCMCIA and 32-bit CardBus PC Card including Panasonic P2 card, ATA Flash Card, DEXIS Card, Hard Disk Drives, Linear Flash Cards (AMD, Intel, etc. chipsets), SRAM Card, Fax Modem Card (wired or wireless 3G / 3.5G AirCard), Ethernet/LAN Card, Wireless Network/LAN card (IEEE802.11b, Bluetooth), I/O card, Cardbus PC card (IEEE1394 and USB2.0), etc. Supports all kinds of PC Card Hot-Swapping feature (insert or remove card without turning off the system). Power saving suspend mode support. 1 year warranty and free technical support. Free technical support from Amtron Technology, Inc.